The Temple of Artemis is located on the west coast of modern Turkey, south of Selcuk county about 50 km south of Smyrna. This place was called Ephesus during ancient times. The God Artemis in Ephesus is a goddess of fertility. This earliest temple supposedly contained a sacred stone, probably fallen from Jupiter. In some instances Artemis is linked closely to the Roman goddess, Diana. She also is goddess of night, fruitfulness, childbirth, beasts, bull and an eternal virgin. The temple was so huge and magnificent that it took about 120 years to build it. Referred to as the great marble temple it was sponsored by the Lydian king Croesus and was designed by the Greek architect Chersiphron. It is sad that this temple didn't last long. 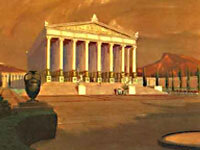 One night a man called Herostratus put the temple to fire in an attempt to immortalize his name. The reconstruction of the building was resumed and it was commissioned to an architect called Scopas of Paros, the best architect of the time. It is interesting to note that Alexander was born on that same day when the temple was burned to ashes. The Roman historian Plutarch later wrote that the goddess was "too busy taking care of the birth of Alexander to send help to her threatened temple". Over the next two decades, the temple was restored and is labeled "temple E" by archeologists. And when Alexander the Great conquered Asia Minor, he helped rebuild the destroyed temple. When St. Paul visited Ephesus to preach Christianity, he had to confront the Artemis' cult who were in no mood to abandon their goddess. When the temple was ravaged by the Goths in A.D 262, the Ephesians vowed to rebuild the it. By the fourth century AD, most Ephesians had converted to Christianity and the temple lost its religious glamor. In AD 401 St. John Chrysostom torn the whole structure down. That was the end to this wonder of the world. This temple was a tourist attraction in its heyday drawing travelers from afar. A local cottage industry produced souvenirs and religious items including miniature statues of Artemis. Hawkers sold them to visitors, which helped the local economy. Seafaring ships once docked in the riverside harbor of Ephesus a bustling ancient city, where the Temple of Artemis was located. Eventually, silt clogged the harbor and its entrance, preventing ships from ever again reaching the harbor. Today what remains in the place of the Temple of Artemis is a marshy field. A single column has been erected to remind visitors that there once stood a Wonder of the Ancient World.